Albert Einstein once stated, “If the bee disappeared off the face of the globe, then man would only have four years of life left.” Although Einstein was probably not predicting an apocalypse-by-bees, the past years have offered evidence of a rapid honeybee decline. According to the USDA, between 2011 and 2012 honeybee colony populations have declined in the United States by 21.9 percent, leaving many fruits and vegetables in trouble as pollination results in $15 billion crop yields a year. Currently, around 2.5 million honeybee colonies exist in the United States compared to 6 million that were present 60 years ago– leaving many beekeepers questioning the root causes of their decline. David Green, director of Albion College’s Whitehouse nature center and specialist in outdoor education, currently maintains two hives on Albion’s campus which are located at the student farm and the science complex. Although the cause of the honeybee’s decline is not yet known, beekeepers and scientists have begun to make conclusions of their own. It is possible that a virus could be attacking swarms; however, many are beginning to blame pesticide and chemical usage as the major issue. Orchards, farms and gardens are thought to be harming the bee population through their use of pesticides. Specifically, many commercial farms take part in pollination management. A process that rents natural pollinators, such as the honeybee, in order to improve their crop quality and raise financial yield. If a farmer sprays a chemical over their shrubs, the bee will then pollinate the crop and unknowingly transport the pesticide to their hive– causing damage to their home and the bees. Chemical usage is not an immediate death for honeybees. However, if not used properly, these chemicals disrupt the bee’s brain processing, leaving them disoriented with a weakened immune system that results in a detrimental spiral for the hive. “Many people think ‘well this is just my backyard,’ but when there are millions and millions of backyards that are using the same chemicals, you have to look at the bigger picture,” Green said. Bayer, a global enterprise specializing in healthcare, agriculture and high-tech materials, believes that the decline in honeybees is a normal occurrence that happens over time – the losses are just now gaining more attention. The company states that in 1872, Australian beekeepers reported massive losses to their colonies due to disease symptoms,and recites other similar examples. However, they admit that the losses are increased in the United States, Europe, Japan and the Middle East, along with the notion that apiculture has massively declined in the US resulting in decreased number of honeybee colonies. Not only does the decline of bees affect the environment, but it could potentially impact the economy as well. Pollination is a natural process that involves the movement of pollen from one plant to the next, and thus creating fertilization and reproduction; a mechanism that most of our agriculture depends on. Humans can pollinate manually, however this can be both time and financially costly. At least 30 percent of our diet consists of an insect-pollinated source, as many fruits, vegetables and nuts depend on pollination in order to reproduce. Conclusively, if the honeybees continue to decline, farmers will not be able to produce at the level Americans are habituated to eating at, leaving higher food costs for the consumer. It is clear and irrefutable that honeybees are currently in a decline, one that may have a number of causes, and these facts may seem discouraging to the average American who lacks beekeeping experience. Fortunately, anyone can aid in the protection and management of the bees in order to support their hopeful, future comeback. Beekeeping can be incredibly daunting to a new beekeeper. However, this trade is regularly low maintenance and much information exists through other local beekeepers and information sessions. Many environmental enthusiasts, like Green, believe that through education the population will begin to recognize the benefits and uniqueness to honeybees instead of automatically looking towards a Raid can to kill a swarm. 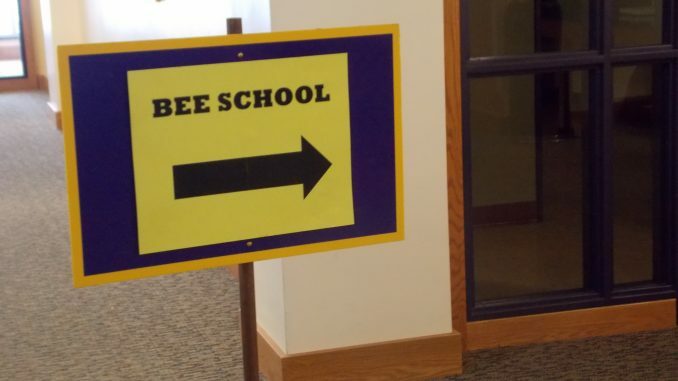 On March 1, Albion College hosted the 4th annual Bee School, introducing beginning and intermediate beekeeping classes, along with hosting local bee vendors. “There are a lot of local bee keepers who would love to have you [beginner beekeepers] shadow them, so I think making those connections with 40 plus people is very important,” Green said. The event offered classes for beginners who are interested, but have yet to become involved, intermediate classes to help further education of honeybees, and expert beekeeping speakers. The affair event was attended by 41 registered individuals, which included both the Albion community and college. Green looks forward to further educating those on the importance of honey bees and their beneficial qualities to the environment. Steve Clark, a vendor at the Bee School and beekeeper from Napoleon Bee Supply of Napoleon, Mich., currently sells honey bee products, but he plans on building hives again soon. Likewise, local beekeeper Keith Stellar from Stellar Apiaries located in Jackson, Mich., has been attending this event for four years as a vendor and advocates the importance of honeybees. Like Stellar, many beekeepers believe in apitherapy–a medical practice that uses honeybee products as a form of healing, dating back to Ancient Greece, Rome and Egypt. This can include honey, pollen, propolis, royal jelly and bee venom– all natural elements of the bee or their production. Most elements of the bee are unknown to humans, aside from honey and pollen. Propolis is used a natural sealant for the hive, but is also product in modern pharmaceuticals. Similarly, royal jelly is a secretion used to nourish the larvae and queen bee, and is currently used as a dietary supplement for humans. Stellar stands by the notion that honeybees are beneficial to the human body as well as the environment. While the practice has been used over a long period of time, few scientific tests have proven the honey bee’s effectiveness medically. Honeybees are unique, beneficial and versatile insects that are currently suffering from the human’s progression. Currently affecting the United States and many other countries, the honeybee’s decline has created a worldwide problem that could leave the environment and economy with serious issues. Fortunately, local solutions have started to emerge in order to promote beekeeping and the honeybee’s existence. Green urges the Albion community to not immediately kill a swarm, but to let it flourish and contact a local beekeeper or himself in order to create a new hive elsewhere. Saving honeybees can be as easy as not using harmful insect repellents, to creating personal hives and boxes in a backyard. Little steps and motions can help promote a healthy lifestyle for both the bees and humans.